For centuries, Oriental Carpets have been considered works of art. The earliest example of knotted-pile carpet was found in a frozen tomb at Pazyryk in Siberia and is now displayed in the Hermitage Museum in St. Petersburg, Russia. Turkey has one of the greatest weaving cultures in history. 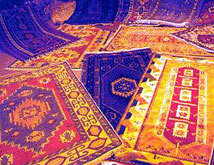 Turkish carpets and rugs have a universal reputation for their unique designs, color combinations and durability. Traditionally colors are extracted from vegetable and plant dyes. Among the best known production centers are Hereke, Istanbul, Yahyali, Milas, Kayseri, Sivas and Isparta.